What is more fun to have in your home than a playful rabbit? To see them hop around and jump from place to place is a wonder to behold, but have you ever thought about how much fun your rabbit is having? We all have our toys; our little luxuries that entertain us and make everything else worthwhile. What does your rabbit have? A playful rabbit should have a bunch of toys to be entertained by and interact with. Not only are toys great for the physical wellbeing of your rabbit (promoting an active lifestyle), they are also great for providing mental stimulation, giving them work to do or puzzles to solve. We set out to find some of the best rabbit toys available and came back with a list which is packed with interactivity, quality, and affordability. Take a look and choose the toy which best suits the personality of your rabbit. This is a high-quality bunny toy which is perfect for all sizes, breeds, and age of bunny. If you are looking for something interactive and imaginative, then you have found it. It is priced a little higher than other rabbit toys, but you are paying for the quality. 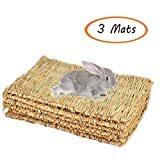 The wood is solid and sturdy, the finish is not toxic to your rabbit or any other pets, and the additions are tough and durable. Your bunny will love to play underneath, beside, and on top of this too. It is colorful and has a variety of textures. Perfect for alone time or times when you want to play along with your pet. Your rabbit will never be bored with this in their pen. Crinkle-crackle paper makes this a fun toy for your rabbit which will make noise with each step, so you know exactly where your bunny is, and they get some auditory reward when they move about. There is a peephole in the middle of the three tubes so you can look in on your bunny when it is playing in the tunnel. 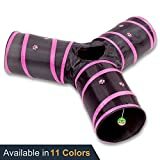 There is also a bell toy at the end of one of the tubes which your pet can play with. The tunnels are crafted from premium and ultra-strong polyester which is tear-resistant. The fabric is wrapped around a metal frame which is solid and sturdy — a great toy for any of your pets. You get so much when you choose this toy selection. 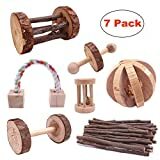 You have a dumbbell and unicycle, both of which are great for pushing around, a watermelon ball, a bell roller, and a small bell roller, which can be used to hide treats inside, a molar block and rope, great for interactive play with your rabbit, and apple tree branches, great for chewing. All of the wood is natural so you will never have to worry about your rabbit. Chewing on these toys will promote healthy teeth and gums for your pet while bringing them a lot of enjoyment. Your bunnies will love these treats. They look and smell amazing, and taste even better. With each package, you get approximately 100 grams, which works out to around 10-14 sticks. You can throw one in your rabbit’s cage, hutch, or run, and let them chew on it for as long as they want. The great thing is that there will be no waste at the end of playtime. 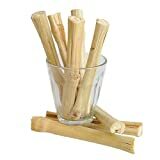 These chew sticks are a great way to help your rabbit with dental hygiene, helping to maintain teeth. They have a sweet taste which your rabbit will love. These grass mats will bring a lot of comfort to your pet. They are perfect for putting in the bottom of mesh cages to protect the feet of your bunny and are also equally welcome in any cage or pen. They are 100% natural and hand-woven and can double as a chew and scratch toy. If your bunny likes to forage and dig, then these are perfect. They are tough and durable and will hold up to a lot of scratching. Working as a chew toy, your bunny can find comfort here and have a good old chew to maintain tooth and gum health. A versatile grass mat which will bring comfort and be a treat. These balls are extremely versatile, and your rabbit will love them. They can push them around with their nose and then stop to chew on them. The great part is that they are crafted from all-natural fibers and have no glues of plastics to hold them together. 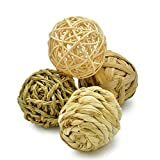 Made from cornhusk, seagrass, hyacinth, and rattan, these balls are safe to chew on, and pretty tasty too. Each one has a different flavor and texture; perfect for nibbling on mid-game. They are great for involving yourself in a game and having some quality time with your bunny. Syrian Hamster or a Dwarf Hamster: What Type is Right For Me? MyPerkyPet.com is a participant in the Amazon Services LLC Associates Program, an affiliate advertising program designed to provide a means for sites to earn advertising feed by advertising and linking to Amazon.com.